Nobody likes to get beat over the head with “you should do this” messages. A large percentage of people don’t like to get told what to do at all or by any means: Beat over the head. Rap on the knuckles. Kid gloves. But how about subtle persuasion? Here is a series of memorable events I experienced over the past six months. They fit a specific theme marked by discovery, concern and then clarity. Event 1. canoLAB in Brandon, Man. in March included a few presentations on other crops, including one by Manitoba Agriculture’s Holly Derksen and AAFC’s Debra McLaren on soybean diseases. In that presentation, I learned about phytophthora root rot: “It is soil-borne and can move from field to field with soil tag on machinery,” the presenters said. Of course I connected the dots to clubroot and a light bulb went on. In canola world, we talk a lot about moving soil, moving clubroot. But moving soil also moves verticillium, aphanomyces (of pea and lentil), phytophthora (of soybeans), weed seeds, nematodes and probably lots more. Every field and possibly every crop is at risk of something that moves in with dirt tag. Event 2. David Lobb, professor in the Department of Soil Science at the University of Manitoba, made a presentation to the Canola Council of Canada agronomy team on April 10. Lobb reminded us that before the grasslands and treed areas of the Prairies were broken for farming, every acre had a layer of “A horizon” topsoil at the top, a lower quality “B horizon” layer below and an unproductive “C horizon” at the bottom. Over time, tillage and erosion removed the A horizon from hill tops. It also removed some B horizon. Good soil that didn’t wash into ditches and rivers or blow to Toronto settled in low areas of the fields. We can all remember seeing those bald hill tops in the days before reduced tillage. The real eye opener for me from Lobb’s presentation – and it seems so obvious now – is that when those exposed knolls of C horizon erode, where does that awful unproductive stuff go? It also moves to the low spots and buries the B horizon and A horizon soil! Lobb says some farms are digging into their low areas to uncover the good soil and pile it back on the hill tops. Event 3. Ag In Motion is a pretty spectacular outdoor farm show. A small city of farmers and ag industry reps pops up in the middle of the Prairies for three days in July. A big draw this year was the tillage demonstration. Big tractors, big tillage tools, turning over, loosening up and moving all kinds of soil. Tillage can be a solution to wet spots, weeds and excess residue, and companies are rolling out some pretty impressive multi-tools. But farmers of Western Canada have been world leaders over the past few decades in adopting successful farming practices that don’t depend on tillage. Event 4. At the same time in that same temporary farm city in a field northwest of Saskatoon, the Redekop booth was much, much quieter than the tillage demo. I talked with Redekop rep Frank Friesen, who knew my home turf quite well. (Dand, Man.) Redekop makes the hefty MAV straw chopper, an after-market add-on that can boost the chop and spread of crop residue, perhaps eliminating the need for residue-managing tillage. 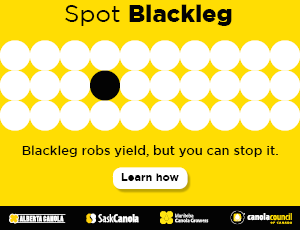 In Canola Watch, we often emphasize the importance of residue management for improved seed placement. We also say residue management begins with the combine. MAV provides a boost where the standard chopper might come up short. In recounting these events, I am reminded why conferences, farm shows and agronomy events are so important to good business. A person can gather various ideas and perspectives, make valuable contacts and collect evidence to justify a new tech investment. And sometimes you discover again why practices your farm adopted 25 years ago are still the best way to go. Catch that subtle persuasion?